All continuing students must complete returning registration via the Student Data System every year. This opens on Tuesday 18th September 2018. Once you have logged on you need to select ‘Registration’ and then 'Returning Registration’. 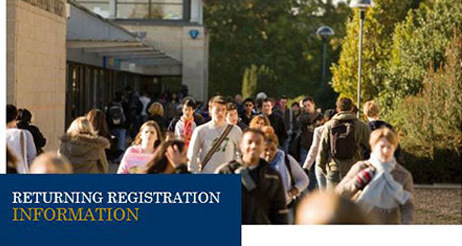 Returning registration should not be confused with course or module registration. If you wish to amend your modules at this time you will need to contact your School directly. When registering you will be required to check your personal details and update them if they have changed. If you are funded by the Student Loans Company completing returning registration will usually trigger your funding payments. Payments are normally released within 3 – 5 working days of your registration. If you are unable to register due to an outstanding debt or finance flag on your record you should contact the University’s Income Office for assistance. Please note that fee payment does not mean you are registered. Failure to complete returning registration may result in you being unable to continue your studies.